I experienced something new last week: The online library system said I couldn’t reserve any more books because I’d reached my (25-book) limit. We’ve been working our way through the SLJ’s Top 100 Picture Books, and I reserved the next chunk of them that are available at our library. 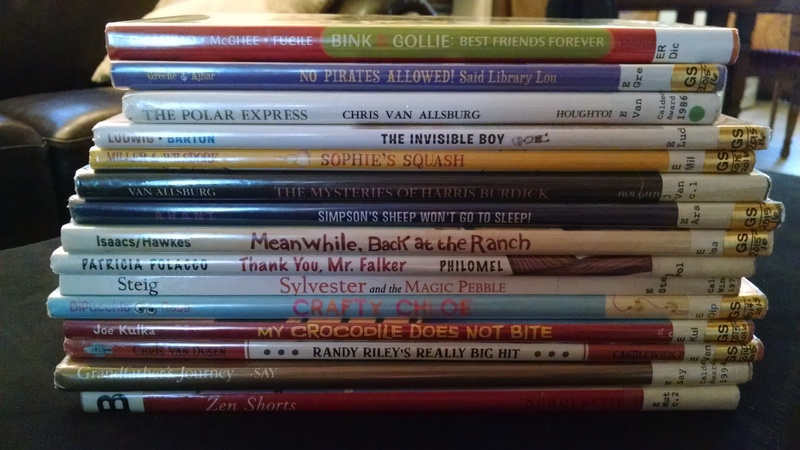 We’re more than half way through that list, and I’ve added a few other lists to what I’m keeping track of, in terms of picture books. Let’s see, I’m tracking Caldecotts and 1001 Children’s Books You Must Read Before You Grow Up. Have you read any of these picture books? What are yours, or your children’s, favorite picture books? Have you worked through book lists like this? How do you decide what books to bring home? This entry was posted in books, children's, picture books and tagged nablopomo, reading. Bookmark the permalink. I haven’t tried reading through any lists with my daughter yet, but we love to visit libraries in our area. At this point, she’s a bit too rough with paper pages, so we only bring board books home! I can’t wait to start reading all the beautiful picture books with her though. At home, one of our favorite picture books is Giraffes Can’t Dance. The rhythm is great and the pictures are so colorful. A nice rhythm is a wonderful thing in a children’s book! I love that he’s so excited to pick up books like that! Me too! I hope books always excite him. I’m excited for A just looking at that pile!